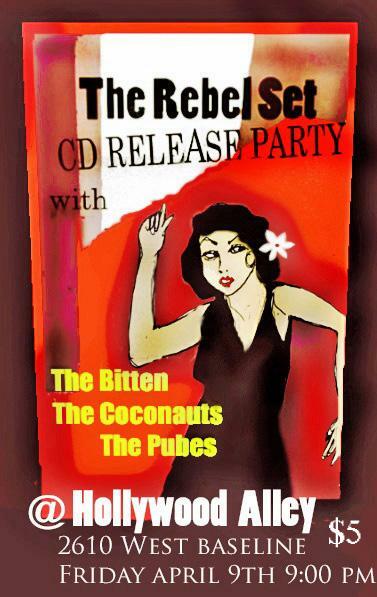 CD RELEASE PARTY, THIS FRIDAY NIGHT! (excerpts from ASU West Times article by Lauren Cusimano) "The Rebel Set is a talented surf rock band that is definitely something to be recognized as a local sound off the beaten path. Fans of old-fashioned surf punk enclosed with a fuzzy garage sound will definitely find a home at their shows, along with enjoying a personal spin of the anticipated album. Some of the band's influences include: Link Wray, Rocket From The Crypt, The Tornados, Screaming Jay Hawkins, Holly Golightly, The Raveonettes, Buddy Holly, Duane Eddy, The Buzzcocks, The Ventures, The Original Surfaris, Lee Hazelwood, Nancy Sinatra, The Ronettes, Al Casey, Hubb Kapp and the Wheels, and Ryan and the Wipers. "